As part of the Gravure Montréal facebook page I will be asking print media artists to provide some insight into their work and explore the impact that printmaking has had on their creative process. 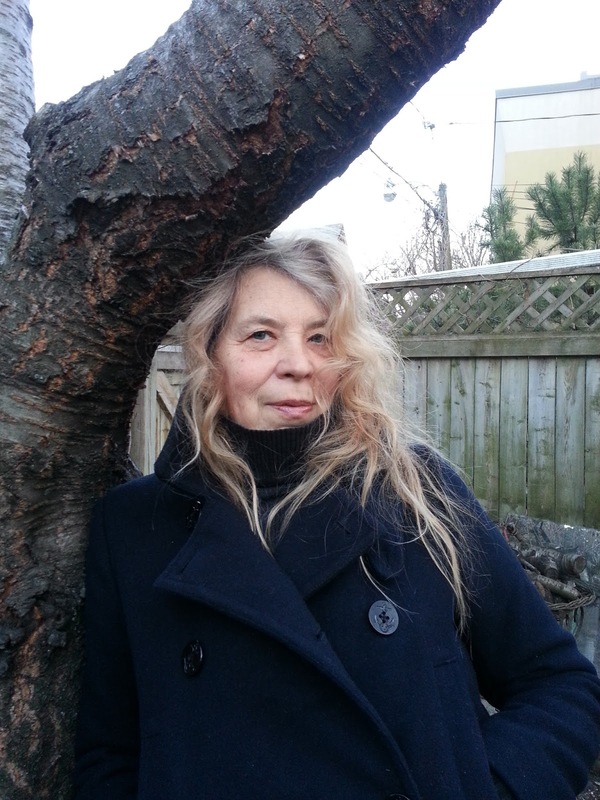 Irina Schestakowich is a Toronto-based artist and is a member of Open Studio.I first encountered Irina's Doll Works when I was a child visiting artist Sybil Rampen's farm and studio in Oakville. Irina had created the most wondrous series of beautiful dolls. These small dolls seemed to me to be a fascinating collection of opposites. The dolls were sewn collages consisting of soft bits and hard bits. Fragile, vulnerable and strong, contained yet exploding with life, these tiny beings had such a strong sensuous presence they seemed alive. Warm hand painted faces beamed and observed, their apparel, an explosion of asymmetrical details created from fabrics and objects that came rich with the patina of a life filled with stories. Later, much later, I'm not sure when exactly, I discovered that Irina was a printmaker. AJM: Good morning Irina! Thank you for being so generous with your time and self. Let's begin at the beginning. Who are you as an artist? If this seems vague I mean how do you describe yourself as an artist? Does being an artist mean filling a particular role in society?What are parallel roles? I see on one of your works you described yourself as a maker of Wall Works and Doll Works. What are Wall Works? so intriguing and also perhaps just practical descriptions! IS: I was always a Print Maker first. I stared creating my Doll Works as a small way to keep being creative when my child was born and I was stuck at home in Victoria, BC. Wall Works came later. My money maker. I was getting commissions to make walls very print-like to enhance people’s private spaces. This is where I use my know on a large scale. It was still overlays, washes, rubbings, drawing, ~ very much like I do monotypes but on walls. It kept me financially afloat. AJM: What does your creative process look like? How do things get made? IS: I always start in books. My daily practice is keeping my art books active. It has nothing to do with being neat. just getting thoughts down. Then if I see a sequence I act upon it. Inspired by my notes I start printing the thoughts. It is usually in a series because I like to work through it. I never know what the final results will be until I do that. Like writing a book when you don’t yet know the ending. AJM:Do you make deadlines for yourself or work on things constantly? IS: I work every day, in one form or another. IS: When I have nothing left to say about it. AJM:Do you make things and never show them to anyone? IS: Definitely! Lots! Stored for always later. IS: I am very true to myself. I never compromise. It’s almost like ‘for better or worse I will be there’. no matter how tough it is. I NEVER give up. AJM: Why do you do what you do? What is your motivation to create? What keeps you going? do you have a mission? IS: My whole thing is basically to focus on other things than our life difficulties. Although I focus a lot on the news, I don’t go there visually. too negative. I am obsessed with the news but my reaction is to go totally opposite to what I hear. I am the antidote to bad news. I also think that there are so many other things that we can relate to besides ourselves so my whole attention is to the unknown, the ‘other’. Like: ‘Drink this Irina Potion and you’ll feel better’. I feel like I’m the Florence Nightingale of the psyche. My prints can contain the antidote to all the never ending violence I see in the world. 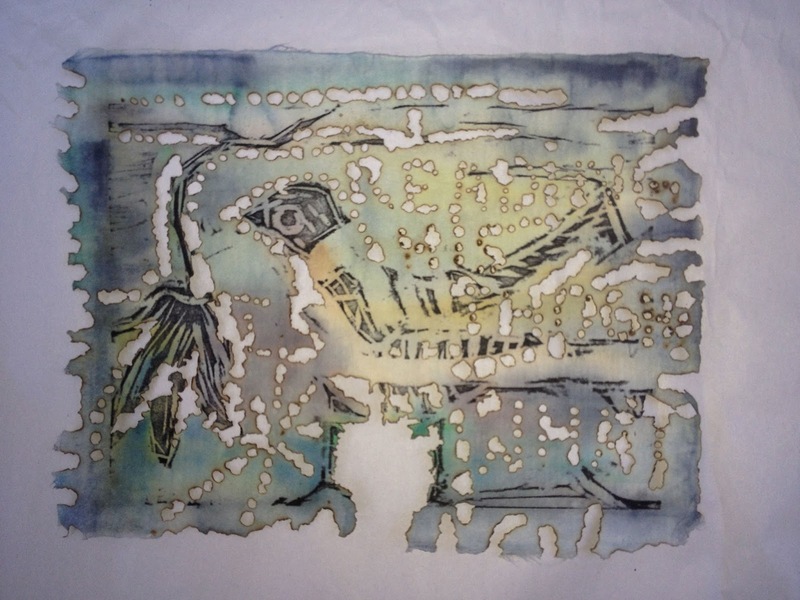 AJM: How has printmaking been an important part of your art practice? IS: My first printmaking lesson was with Suzy Lake who then was just about to leave Montreal and head out for Toronto. I grew up in Montreal and she was so exotic to me from Detroit. The American PrintMaker! From that first encounter I never stopped printing. like an addiction I drink paper and ink. I love the solitude of it. I always think about coming across a print by Hundertwasser called Irinaland. I jumped. I thought, ‘I feel like that!’. AJM: Like you, I am drawn to the most physically demanding form of printmaking. How is touch important in your work? Does the amount of sweat and energy and repeated actions matter to the success of the work? IS: Me too. I like the physicalness of it. You refine your actions as time goes by. At a certain point you don’t even think about it. You think you know it but there is so much more about it. That keeps me going. AJM: Did you have any mentors? Who or what inspires you? IS: 1. Suzy Lake gave me my first lesson in printmaking in Montreal just before she moved to Toronto. I thought of her as the exotic printmaker from Detroit. 2. Pat Martin Bates from University of Victoria. Not that I learned a lot about printing from her but she taught me about thinking the artist’s way. Reading Rumi, being in touch with the effect of words, the spirit of what being an artist is, awareness, not just the act of making art. From her I also learned the power of making art. I am passionate about the works of Odilon Redon and Cy Twombly. Before then as an very young child I spent a lot of time in the Montreal Museum of Fine Arts on Sherbrooke St. and started to do my own research on the what seems to me to be a maze of things. My parents were immigrants focussing on surviving and Art was the last thing on their mind, so I was very much on my own. I had to find my own way and took the opposite route in my own life and stayed true to it regardless of any and all obstacles in my life. And there have been many. AJM: What is a successful artwork for you? IS: A piece that feels I just blew it onto the paper. It looks effortless,s without strain. It is less about thinking and more about feeling. Which creations are your favourite? IS: Actually there is a small series I did 15 years ago which I have never yet shown, called Flower Language. It is on the thinnest of the Arches paper and that led me to switch to using Japanese paper. Basically I was thinking of China and its quiet acquisitions in the world. I kept thinking they are so poetical that the currencies and transactions would be disguised as flowers. Adding mystery to monetary matters. It would be great exhibited in a stock exchange somewhere internationally someday. Timely now. What is your dream project/artistic situation? IS: Haven’t thought about it. 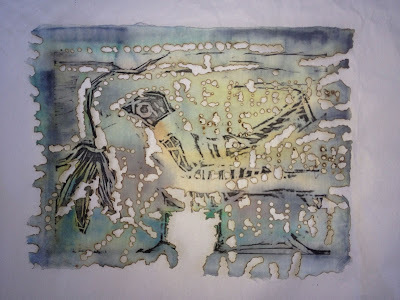 AJM: Have you noticed any commonalities amongst printmakers? IS: Yes they are all love their privacy and solitude. 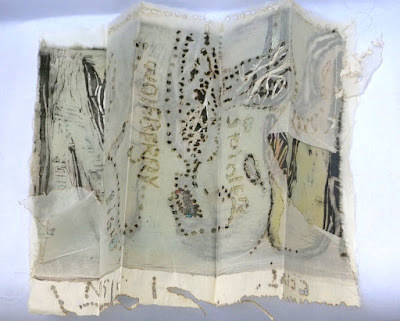 AJM: As I think about your work I feel that your creations are somehow about making the most of everything you have, claiming everything, the power of transformation and imperfection as pathways or for viewers to enter into the works, add their own stories while hinting at your own. Perhaps I think this because I feel that the process of how the work was made is an important aesthetic element. Is there any truth in that? Does the teachings or aesthetic of theatre ever enter into your work? Do you think about the people who see your work or is the work directed by a strong narrative of your own? IS: I do my art and that’s it. AJM: You are incredibly prolific and diverse in your art practice. You sew and sculpt, work with murals, fabric, paper, metal and wood. Your works often seem ephemeral and fragile. What do these fragilities add to your work? IS: Yes, you are right. 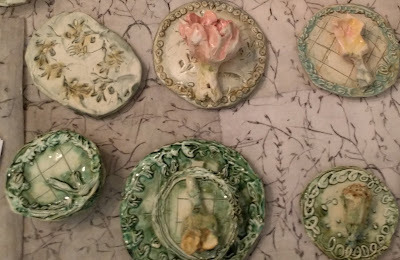 For the past few years I have been doing a lot of wood cuts but lately I have been trying to work with clay as a way to rewire part of my thinking. I took a little holiday from paper. I’ve been making clay stamps for mark making. (Can’t stay away from printing I see). Somehow I want to merge the paper techniques and clay together. I believe it is always important to keep one’s sense of play and exploration. This leads to new ways. Essential. I do love fragility. I am intrigued by it. by the whips of things. Do you mind if your works disappear, are you possessive of them or is it ok for them to decay? IS: Yes they can disappear like everything in life. I am not obsessed by the permanence of anything. There is no such thing. AJM: Who are the women in your artworks? IS: SHE its the essence of all women. I think woman are great. I am about women’s ways. I am not a man and I have no desire to be one nor even to understand their ways. AJM: I notice many of your work contexts are in the home, or part of creating homes. Is living with the artworks part of completing them? IS: Actually my environment IS my art. I treat my home as art and yes my art lives easily within that. All my writing is done at home and in that silent retreat my creativity thrives. My initial idea start there. AJM: What are your current and upcoming projects we should check out/watch out for? IS: I am having a tiny show of my recent Floral Clay Works, April 6 for a month at Index G at 50 Gladstone, Toronto, ON. AJM: Surviving as an artist can be tough, with oodles of rejection, working without pay etc. Do you have any 'artist survival tips'? What do you do to remain inspired?Do you have any observations or advice would you like to share to remaining inspired and navigating the art world? IS: Do whatever you have to do to still remain in the act of making. At times this means ‘scrub a floor’. Try not to think too much about it because there is nothing rational or practical about it. You’d just talk yourself out of it. Forget the rational. Yes it is tough and it takes a lot of courage to hang in. and you always have to fight self doubt like the dragon. Keep on truckin’. Being an Artist is a special life like no other. See it as a gift and honour that within you. Know it has enduring value.